Alas, the Foolish Theatre Company does not accept scripts, synopses, or submissions of any kind. As you can tell by our humble website, we’re a small theater company without the resources to consider outside work at this time. The Dramatists Guild Resource Directory is published annually by the Dramatists Guild, the organization of professional playwrights. To get the directory, you have to become a member. The good news is that there are several levels of memberships, including ones for beginning playwrights and students. 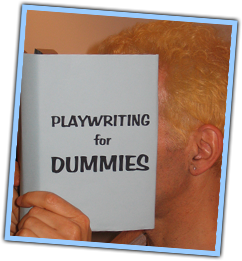 The Dramatists Guild is a worthy organization responsible for most of the fundamental rights which professional playwrights now accept as unassailable, including the right that nobody can make changes to a playwright’s script without the playwright’s permission. All of the above contain opportunities for plays of all lengths. One final note: Although my plays have received numerous productions, I’ve also gotten literally hundreds of rejection slips (sometimes arriving years after I sent the script). A theater can only choose so many plays per season, and the more I meet producers and artistic directors, the more I appreciate the array of challenges they face choosing plays for their audiences. Also, some of them are jerks. Rejection is inevitable in this business. So don’t let it get you down, or keep you from pursuing your dream.